Led by a dynamic Chief Minister who realizes how vital the internet is for the growth of an economy, the state of Andhra Pradesh plans to provide internet connections to nearly 12 million households in the state at an amazing speed of upto 15 Mbps. Not only this, the Rs 5,000 crore project which is getting huge patronage from Chandrababu Naidu, will come for as low as Rs 150 per month during its first stage. The AP state government has requested the Centre to release its share of funds from the National Optical Fibre Project (NOFN), the main aim of which is to link 2.5 lakh gram panchayats across the length and breadth of the country by December 2016. The NOFN project, which is a part of the visionary Prime Minister Narendra Modi’s Digital India Initiative will require a total of 700,000 km of optical fibre to be laid out across the country. The cost of the ambitious project which was earlier estimated to be Rs 20,000 crore has now been revised and increase to Rs 30,000 crore. “As internet will reach villages and all cities, the people there will go online to shop for things which will lead to expansion of e-commerce and opening up of more warehouses. This will lead to creation of more jobs and growth in the economy,” the Minister of Communications and IT Ravi Shankar Prasad had said earlier. The project proposed by the AP government can go ahead only if the Centre gives its nod. “AP has asked the Centre for permission to execute the broadband project on its own. The state has requested for its share from funds earmarked by the Centre for NOFN project in the state. The Telecom Commission on January 7 accorded in-principle approval to the proposal with some riders,” an official source told PTI. If such high speed does become a reality, users will be able to download full length Bollywood movies or other video files equivalent to a movie in only SIX minutes! Not only does that sound too good to be believed, the prices at which the service will be made available is mind-blowing too! Rs 150 a month seems like peanuts compared to the Rs 1100+ (Andhra Pradesh has lowest internet rates in some parts already) being charged by private telecom operators for similar speeds in the state of AP for the moment. The government of the state proposes to execute the project for an estimated cost of Rs 4,913 crore in a five year time frame while the Centre has set aside Rs 1,940 crore for the purpose. “The state has said that it will arrange remaining funds on its own,” said the official. The project, if approved by the Centre, will be carried out under the aegis of a corporation formed by the state and named the Andhra Pradesh Fibre Corporation. The completely state owned corporation will own the assets and manage the network. The state also proposes to set up another entity called ‘Digital Andhra Corporation’ using Public-Private-Partnership model to help in creating an ecosystem for broadband adoption. Ravi Shankar Prasad, the aforementioned minister has already launched the NOFN in the Idukki district of Kerala today. The state which has already been connected by the fibre completely will become the first Indian state to be covered by broadband connectivity under the NOFN scheme. "Too Good To Be True? 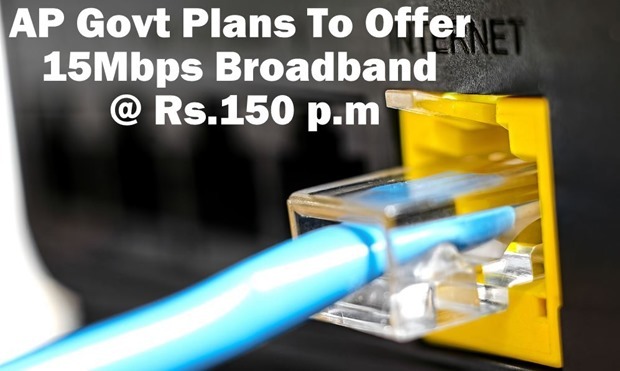 AP Govt Plans To Offer 15Mbps Broadband @ Rs.150 p.m", 5 out of 5 based on 1 ratings. Alibaba To Invest $575M In Paytm at $1.9B Valuation. Beware! Locky Ransomware Is Making A Comeback – Here’s How To Stay Safe! 15mbps just for ?150/month? awesome. so according to exact statistics, we can use 4,746 GB per month and airtel’s total bandwidth in India will be consumed by just 1,31,072 and if all pay ?150/month, then airtel gets total of ?1,96,60,800/month and loose 10,000crores per year. Doesn’t this sound ridiculous with false plans? Its completely flase plan and it will effect on all private sectors. my name is ajay garg and i am from RAJ. i want to know about your plan of 3g network avilable in all villages n city .